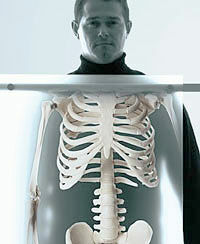 Common radiology tools which chiropractors use are x-rays. They can reveal things like scoliosis (curvature of the spine), abnormal congenital anomalies of the vertebrae or pelvis, fractures, infections and spinal decay. Spinal decay is the very slow deterioration of the spinal vertebrae, usually as a result of uncorrected spinal misalignment (subluxation) from previous trauma, similar to tooth decay. It is also commonly called "arthritis" or "degeneration". It can happen to anyone at any age, however more common in the elderly. Three Phases to the Process - Spinal decay is usually a 3-phase process that is slow and progressive, if uncorrected. 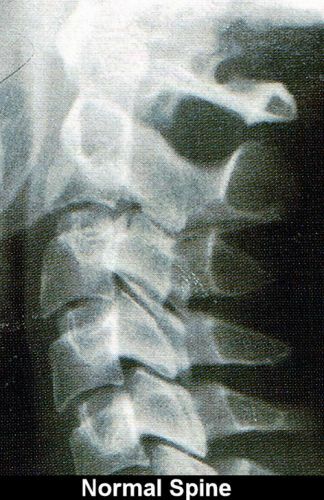 All the x-ray views displayed are left-side views of the cervical (neck) spine. 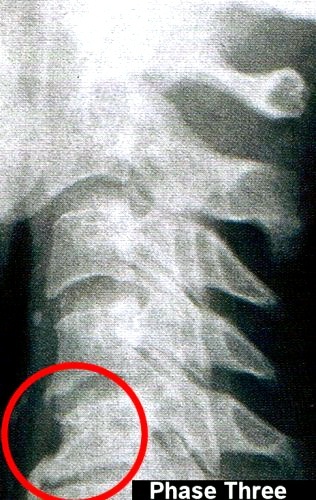 To the right is a textbook normal side view x-ray of the neck. Notice the normal curve with equal disc spacing. The vertebrae have nice smooth edges and the openings of the nerve channels are essentially clear and unobstructed. Prognosis - regular chiropractic checkups are recommended for early detection and prevention of spinal decay. 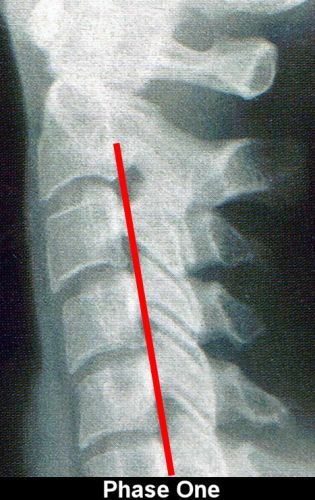 In phase one, x-ray view to the left, there is a loss of the normal curve. Spinal misalignment (subluxation) with soft tissue damage and nerve irritation is present. Symptoms - some stiffness of the neck, pains may come and go, headaches, shoulder and possible arm pains. Prognosis - return to near normal may be expected with regular chiropractic care. In phase two, x-ray view to the right, the disc becomes narrowed with calcium deposits (spurs) forming on the margins of the vertebrae. There is apparent roughening of the vertebral bodies with nerve irritation. Symptoms - increased stiffness, numbness/tingling of arms/hands/fingers, headaches and shoulder blade pain. Prognosis - slowing or stopping of advancing spinal/disc decay may be expected with regular chiropractic care. 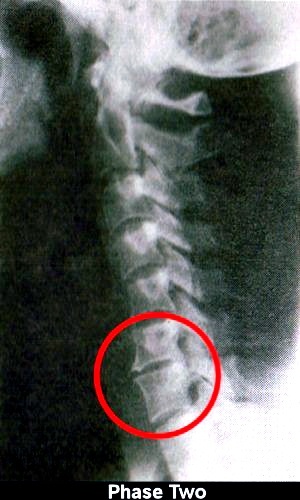 In phase three, x-ray view to the left, spinal degeneration continues and the bones in the neck start to fuse. The joints become immobilized and often nerve root compression occurs. Large bony spurs are deposited on the front and back of the vertebrae. This process can take years to occur. Symptoms - severe pain and markedly reduced neck movement; stiffness, headaches, often weakness in grip strength, numbness/tingling in hands/fingers. Prognosis - some relief may occur, but at this late stage it can be rare.